Crowne Plaza COOGEE ARTS FESTIVAL, Feb 09 present THE SERVANT OF TWO MASTERS by Carlo Goldoni at Grant Reserve Amphitheater, Beach St Coogee. The festival began in 2004 with a performance of Shakespeare's TWELFTH NIGHT. This year Mr Watterson has curated a production of the great Italian, Carlo Goldoni's (1709-1793) THE SERVANT OF TWO MASTERS. This adaptation by Australian playwrights Ron Blair and Nick Enright has been directed by Darren Gilshenan from a production first produced by The National Institute of Dramatic Art in 2008. This is a fabulously rambunctious, knock about comedy, wonderfully adjusted to the outside venue by Mr Gilshenan. All but one of the actors are recent graduates of the Institute and are engaged in their first professional engagement. Miranda Tapsell, Arianwen Parkes-Lockwood, Josh McConville, James Elliott, Andy Cunningham, Alex Russell, Nick Maricic and Demetrios Sirilas are joined by Lindy Sardelic in creating a totally fun evening for all the family. Broad physical comedy and very bold "commedia" characterisations, along with some hilarious jokes tell a very silly and enjoyable love story complicated by a servant, Truffaldino, who finds employment with two different masters. "Two masters, two wages, (means) two dinners-too right!" Confusion and passionate pursuits of lovers ensues. All ends well and it is a great relief when at last it does. One has laughed exhaustedly. All of this handsome and charming band of actors are in great form. Josh McConville as Truffaldino is tremendous as the overworked servant. Demetrios Sirilas, as a hysterically love-lorn young man is hysterical in the ploys he undertakes to win his bride. 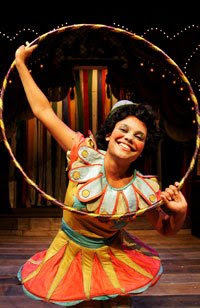 Miranda Tapsell gorgeous as the wiser servant in the play. Andy Cunningham and Lindy Sardelic are well matched as the lovers in the "master's world". Both swash buckling and delectably handsome in their swaggering postures and deceptions. Alex Russell creating two amazingly funny people strikes the right notes in what is a particularly difficult task in the open air. Two VERBAL comics (this is in contrast to the physical choices that most of the other actors have.) Therefore especially marvellous. Watch and listen closely. Handsomely costumed by Charli Dugdale in period - like clothes inside a setting designed by William Stewart that is significantly atmospheric and deceptively simple, the actors and the audience enter into a pleasurable experience of the imagination. A live musician, Phillip Johnston, is included to add to the fun and atmospherics.The director Darren Gilshenan deserves great credit for his vision and skill in the very fine disciplined work he gives us. From little things great things grow. The Coogee Arts Festival is six years old and the presentation of this work sets an enviable standard of achievement. This is a great gesture for the community of Randwick. Playing now until 28 February. Book online through Moshtix or call 1300 GET TIX (438 849).